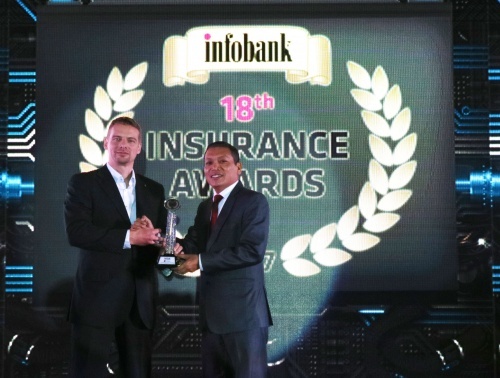 Meanwhile, Sompo Insurance Indonesia received achievements from Infobank magazine for the 1st rank as best general insurance for the category based on ”Joint Venture” company and becomes one of “The Very Best” general insurance company for ten consecutive years. The award received by Mr. Eric Nemitz, our Chief Operating Officer (COO) at Ayana Mid Plaza Hotel, Jakarta. Sompo Indonesia got the 1st rank amongst other 20 joint venture company in Indonesia with the score 91,54 based on asset, own capital, and financial performance. The “Very Best” award also proves that Sompo Indonesia has a strong performance for 10 years without a pause in the line of asset, investment, own capital, gross premium and profit before tax, whereas Indonesia's economic condition is still unfriendly.